We thought our luck had finally run out when we crossed the Albanian border and the smooth, paved road immediately turned to gravel under our tires (for the next 70+ km). We knew things were worse when the coasting downhill we’d expected turned out to be more uphill, and the road deteriorated from grated pebbles to rim-bending boulders. We made it about 10 km into Albania in the first 6 hours of riding—the amount of time we’d budgeted for the entire day’s journey to Shkoder. Then, things really got worse: the road momentarily got smoother and tricked us into breezing past a small town with water in their stores, cafes, and a nice camping spot. We figured that with the good road, we could still make it to the coast. After about 15 minutes of paradisiacal downhill riding, we got to the pass that I can only assume gives these hills the namesake of “Cursed Mountains.” The sun was out in full force, squeezing every ounce of moisture from our pores and quickly forcing us to drain our water bottles. With nothing left but an apple and a cucumber for hydration, we slowly pressed on, walking our 20-kilo bikes up 10% grades and treacherous switchbacks for over an hour before Albania decided to relent. Finally, a break came when a friendly shepherd offered to flag down a truck to give us a ride. He succeeded in his first attempt, and we loaded our gear into the flatbed of a truck heading in our direction. With our benefactors at the helm, we traversed the pass that clearly would have been impossible for us on our own, especially given the state of our water supply, our fatigue, and our battered wills. The ride was an eye-opening experience. We’d heard that the pass we attempted to cross was over 700 vertical meters, but the reality of that distance didn’t strike us until we looked down from the top, into the tiny, rocky river below. If we’d been at the tip of a skyscraper, looking down at the base, it would be just slightly shorter than Dubai’s Burj Khalifa. Stephanie carried an impressive conversation in pidgin Italian for over 45 minutes, and then they left us on the smooth tarmac of a small town just 30 km from Shkoder. The sun was already disappearing, so we posted up in Koplik for the night—20 km short of our original goal, but securely nestled in the agricultural Albanian flatlands. Terrain: We cycled about 87 km along the notoriously dangerous SH20 mountain road. Mostly uphill with strenuous climbs over mountain passes. In Montenegro the road is paved. 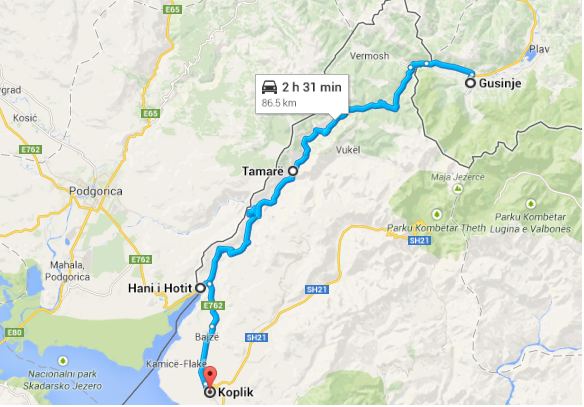 Once in Albania, the majority of the road from Vermosh to Tamare is in very poor condition, all rocky and none of it is paved. Frequent steep ascents, descents and deep puddles of water. Since you’re going through mountian passes, it can be hot one minute and windy with heavy rain the next. The road between Tamare and Hani i Hotit is under construction, and be aware of a very steep climb before entering the flatlands. Note Google Maps indicates there are several “villages” between Gusinje and Hani i Hotit, but they are really just a few scattered houses. We did this ride in one day, but it was exhausting: prepare and carry extra water and food to have a safe and enjoyable trip on this road.